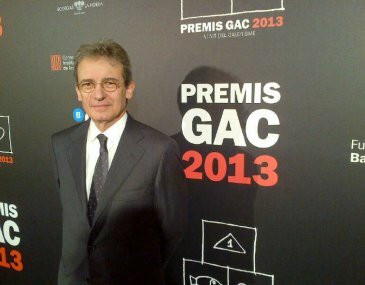 Last night the sixth annual GAC awards, organized by the four associations of Catalan art galleries, were held at the MACBA Museum of Contemporary Art in Barcelona. Below is an extract from the speech of thanks that Ernesto Ventós gave in receiving the award. “First of all, I want to thank the GAC Awards Committee for this award and congratulate the other winners. 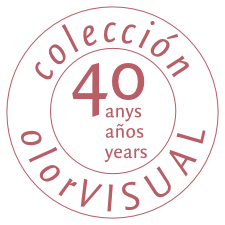 I started OLORVISUAL 35 years ago. I was taking part, as a perfumer, together with various colleagues, in the exhibition Olfactive Suggestions at the Fundació Joan Miró in Barcelona, which addressed many issues related to smell, but not the relationship between smell and art. Albert Ràfols-Casamada caught on to my idea of olfactory art at once, and it was with his painting Lavender that I started the collection. He opened the doors of artists’ studios and galleries to me. My way of collecting, may be somewhat different, because my olfactory memory is engaged: when a work of art communicates something special to me, I immediately say ‘this piece has a smell’. What I mean here is that my smell-related memories have been awakened and my memory starts to call up evocations. Sometimes it’s hard to explain, because people ask me what a particular work smells of, and my answer is always the same: it doesn’t smell of anything in particular but a set of sensations that are similar to what I have experienced and have stored in my memory. For me, the main thing is to get through to the people that come to see the exhibitions, where they come face to face with the artworks and their sense of smell, because our aim is to draw attention to this sense that is at once so intimate and yet so neglected, that guides us, and without which we would have serious difficulties in relating to the world around us. This is why we attach so much importance to the educational programmes that we put together around each exhibition, where children — who, fortunately, still have an innate spontaneity — play and learn about the world of art and the world of smell. Although I have been collecting for many years, I’m still learning from my fellow collectors and their magnificent collections and I hope we shall continue to support each other for many more years to come. Allow me to take this opportunity to ask Barcelona City Council and the Generalitat de Catalunya to spare a thought — difficult though the times are — for the enormous effort we all make as collectors. We would like to receive more institutional support, which would enable our collections to reach the public more easily, and we would like us all work together so that our culture may go as far as possible, both in terms of number of visitors and in travelling beyond our borders. I would also like to thank the artists, without whose works this collection would not exist, and the gallery owners and staff who, over the years, have helped me so much. Finally, I want to thank my family for the support that I have always enjoyed from all of them, making it possible for me to put together this collection. Congratulations to the other winners: Galería Carles Taché, Anna María Guasch, Casa sin fin, Marta Gili, Escletxes (Barcelona Televisió), Adrián Melis and Antoni Muntadas.